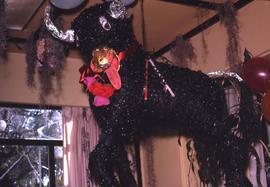 Colour Kodachrome 35mm slide depicts a piñata that is shaped like a bull and is black with silver horns and tail and a red and gold mouth. Colour Kodachrome 35mm slide depicts Phyliss Snider sitting in a carriage with an unknown man with two white horses pulling the carriage. 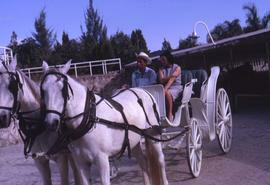 Colour Kodachrome 35mm slide depicts Phyliss Snider sitting in a carriage with an unknown man. Colour Kodachrome 35mm slide depicts Phyliss Snider crouching next to items on the ground that are for sale, including wicker bags and a chess set. Colour Kodachrome 35mm slide depicts a turkey on a golf course. Colour Kodachrome 35mm slide depicts a sign that reads: "Green Fees, $25.00, Please Purchase Your Ticket at the Hotel Ixatapan Office, Caddy Fees 9-holes $5.00 18-holes $10.00". Sign that reads: "Campo de Golf, Nueva Ixtapan"
Colour Kodachrome 35mm slide depicts a sign that reads: "Campo de Golf, Nueva Ixtapan".